I really like to look like a history book. I can look 1940s, I can look 1970s hippie-chic, or sometimes I’ll pull that ’80s Brooklyn hip-hop kid with the door-knocker earrings. I have read somewhere, ” I don’t want to brag of make anybody jealous. But I still fit into the earrings I wore in high school”. Yes, I do have earrings from my high school. 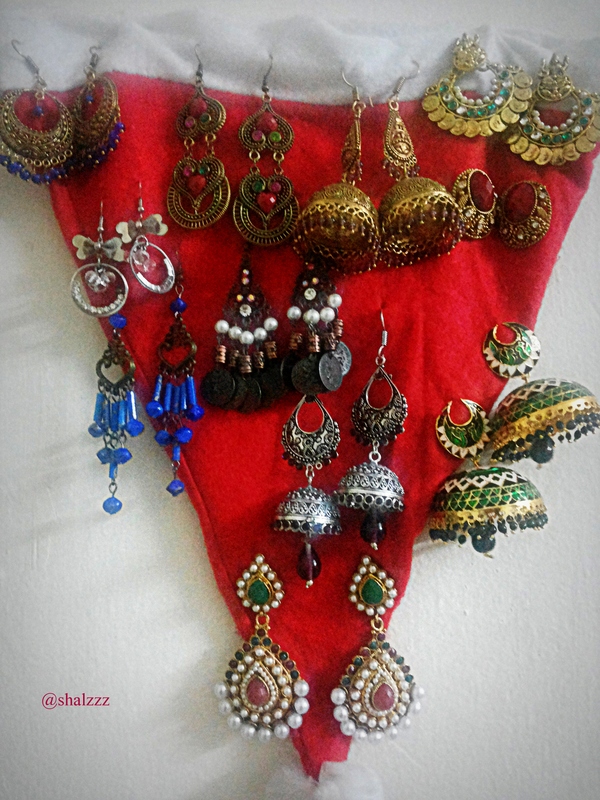 My Mom used to scold me lots for always buying one earring after the other. But, she knew I always kept it safe. Great collection you have, I am lately very fascinated with the different peacock designs and I have picked up some 🙂 how such little things give you a reason to smile. You’re not the only girl with an earrings fetish, Shalini! You should check out my collection! Wow so lovely. Wish I could beg, borrow or steal some of them. Lovely collection there, Shalini. Of course though I am not crazy about earrings, I can’t help shopping them for my daughter and niece. They have quite a collection courtesy me. Earrings huh? Well, my sister has a craze for key chains, somewhat similar. 😀 That’s some collection! Oh my goodness — those are really something. How many pairs do you think you own? 🙂 Quite a collection~ I am fond of earrings too.